Buick is renowned for its reliability and family-friendly builds. 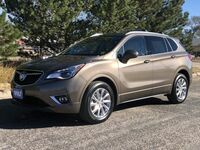 The 2019 Buick Envision seats up to five and has 57.3 cubic-feet of cargo space to work with. Paired with the safety and technology features, you and your family will arrive to any journey in comfort and peace of mind. 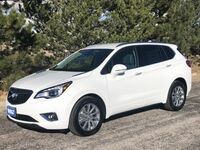 The 2019 Buick Envision keeps the reputation going by offering five trims options to choose from –1SV, Preferred, Essence, Premium, Premium II- to make sure to be the perfect fit to you. Each model has an estimated 29 highway miles to the gallon with the standard 2.5L engine. Read more to find the trim that is right for you and your family. 1SV - Standard features included in the base model are Reclining/Sliding Second-Row Seating, Push-Button Start, QuietTuning Technology and 60/40 Split-Folding Rear Seats. There is the Stop/Start technology that automatically shuts down the engine when you come to a stop and starts when you release your foot from the brake. Starting MSRP is $31,995. Preferred – Added features include Hands-free Power Liftgate, Rear Park Assist, Rear Vision Camera, and Smartphone Connectivity. Other safety features include Rear Cross Traffic Alert and Lane Change Alerty with Side Blind Zone Alert. Starting MSRP is $35,250. Essence - Added features include Rear Cross Traffic Alert, Perforated Leather-Appointed Steering Wheel, and Heated Rear Outboard Seating. Other safety features include Lane Keep Assist with Lane Departure Warning and Forward Collision Alert. Starting MSRP is $37,550. Premium - Added features include 2.0L Turbo 4-Cylinder SIDI Engine, Forward Collision Alert, Lane Keep Asst w/ Lane Departure Warning, and Bose Premium 7-Speaker System. Starting MSRP is $40,700. Premium II - Added features include Automatic Parking Assist, Heated and Cooled Front Seats, Head-Up Display, and Buick Infotainment with Navigation. Starting MSRP is $43,600.